Think of Around the Rim as your local politicians would like for you to think of a town hall, a safe forum for all voices in the basketball universe to be heard. A stable roundtable, fluctuating in both voices and trendy issues. We’ve had over 300 unique contributors working at any and every outlet you can think of living all across the globe! Paul George re-signed for four years and $137 million with the Oklahoma City Thunder. 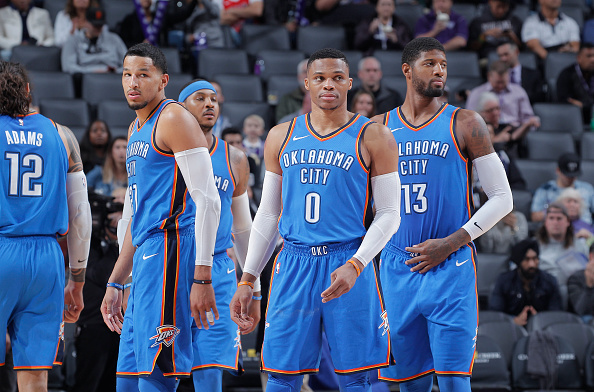 What’s the ceiling of this Thunder team with George and Russell Westbrook locked up long term and what does this mean going forward for teams acquiring players with only one year remaining? Martin: OKC’s ceiling with Russell Westbrook and Paul George will depend on what other sorts of sorcery GM Sam Presti is able to spin with this roster. As currently constituted, the Thunder are looking at a total bill of around a quarter of a BILLION dollars in 2018-19—which is an exorbitant sum for any squad, let alone a small-market team that got bounced in the first round. 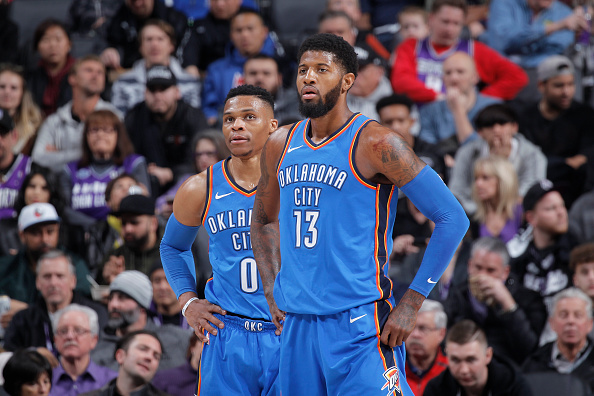 If PG and Russ are somehow able to lure an impact player or two to Oklahoma City in free agency next summer, after Carmelo Anthony’s contract expires, they might have a shot to contend in the west. Short of that—or another Presti-made miracle, be it a gutsy trade or a gem deep in the NBA draft—it’s tough to envision the Thunder truly competing for a championship with their duo. That said, George’s situation should serve as a reminder to teams around the League (especially the Los Angeles Lakers) that if there’s a player out there who: A) you want, B) wants you and C) you can reasonably acquire, you should probably take that swing before someone else does. We’re all looking at you, Kawhi Leonard. Slate: By signing Paul George to a four-year contract, in addition to Russell Westbrook having four years left in his contract, Oklahoma City has a solid amount of time to continue developing their team into championship contenders. One advantage is that PG and Westbrook now have a year under their belt, so the chemistry is established. In 2019, Carmelo Anthony will be an unrestricted free agent, expanding the budget for OKC to potentially pick up a third star. Moving forward, PG is a good example of the value of one-year contracts. It allows for a significant trial period, as well as the chance to sell the player on staying. At the end of his contract, George felt compelled enough to stay in Oklahoma, something that wouldn’t have happened had OKC treated him like a temporary player. Yousuf: I think the ceiling for the team relative to a championship chase is the same whether or not they had retained Paul George. Maybe they’d be in a tighter race for fourth in the West whereas now they seem to be solidified as the fourth seed, but they will not threaten the Lakers, Warriors or Rockets. They should be a better version of what they were last season because the group has a full season of working together under their belt, which will make for more entertainment. Westbrook and George are solid top two and Steven Adams is a good No. 4 but they need a better No. 3 than Carmelo Anthony to compete for a top three seed. As for how this impacts teams acquiring players with one year remaining, I’d say very little. Fact is, if you have an existing superstar like the Thunder did in Russell Westbrook, you’ll have a chance to keep the guy you acquire. If you don’t, he’s out after the year. Wallis: Their ceiling this season is about what it was the past one: fringe first/second round playoff team. With Andre Roberson on pace to be back by the start of the season, this will be a great defensive team again—which should be enough for them to have a fighter’s chance at homecourt in the first round. But it isn’t really about next season. Locking in George for four years (with the likelihood of it turning into seven with a max extension coming two years into the deal) allows the Thunder front office to be patient. Now they can just let Melo ($27.9 million) walk after this season without stretching or buying him out. Then Russ-George will be going into year three together while OKC can find a piece (or pieces) in 2019 free agency that fits much better than Melo. If approached patiently and correctly, next summer could raise their current ceiling. George’s commitment to the Thunder tells us what we all already knew: Money remains the strongest selling point. Sure, he really connected with Russ. Yes, there is “unfinished business.” But the Thunder were able to lock him up because they could give him the most security in dollars and years that any NBA agent would tell his client to seriously consider. If a team wants to acquire a player with only one year remaining and are prepared to offer the type of contract George will likely extend if all goes as planned, then the Thunder have shown a player’s “home” might sometimes be where he can make the most money. Wimbish: This Thunder team as currently constructed can’t make the Finals, or even the Western Conference Finals for that matter. This team just got bounced in the first round of the playoffs by a team led by a rookie. Locking up Paul George for the next four years is a definite bonus, however this team needs another scorer not named Carmelo Anthony in the lineup in order to compete with the likes of Houston and the Golden State. At best, Oklahoma City is a four or five seed. As far as Paul George goes, I think this decision shocked a lot of people who were betting their life’s savings that he was going to Los Angeles. George was the exception, not the rule, in terms of trading for a player with an expiring contract. Not every team in the League can bank on wooing a player to stay after being traded, and it likely won’t change how teams pursue players like Kawhi Leonard who has made it publicly clear that he wants to be in L.A.
After the first couple days of free agency, who’s the biggest winner and biggest loser? Wimbish: I think the obvious answer is the Los Angeles Lakers. Whoever landed LeBron James was going to be the winner in free agency. Is this Lakers team a title contender? Not at all. But this is the first move, not the last move for Magic Johnson and Rob Pelinka. If they’re able to pull off a trade for Kawhi Leonard then the Lakers are back in the conversation, but for now they have the luxury of having the best player in the League on their roster. The biggest loser is the NBA playoff structure. 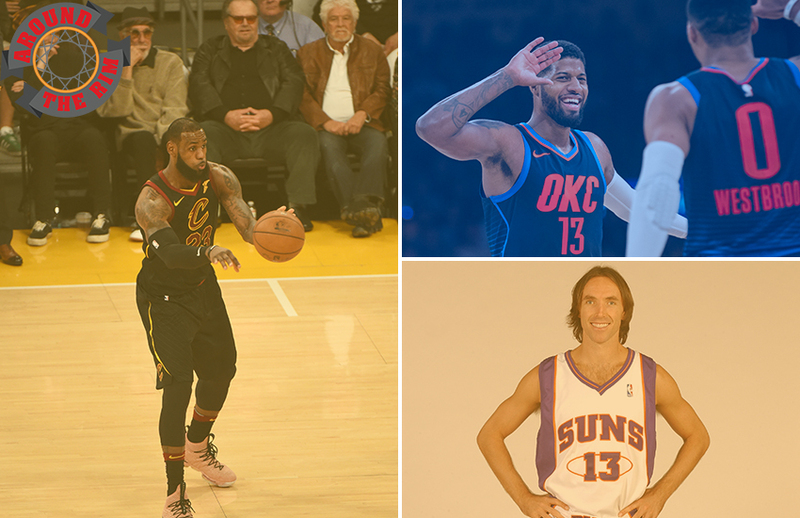 With almost all of the League’s current stars in the Western Conference after LeBron’s decision, it starts the conversation again about dissolving conferences come playoff time. Sending the best 16 teams regardless of conference would make for more competitive first-round matchups, and could result in an all-West or all-East Finals. A Finals matchup of the Warriors and Rockets would have been a lot more compelling than what we got this year. If this isn’t the biggest indicator that the NBA needs to restructure its playoffs, I don’t know what will. Martin: Biggest winner: OKC. The Thunder gambled on their ability to sell Paul George on their organization in a year and it paid off. 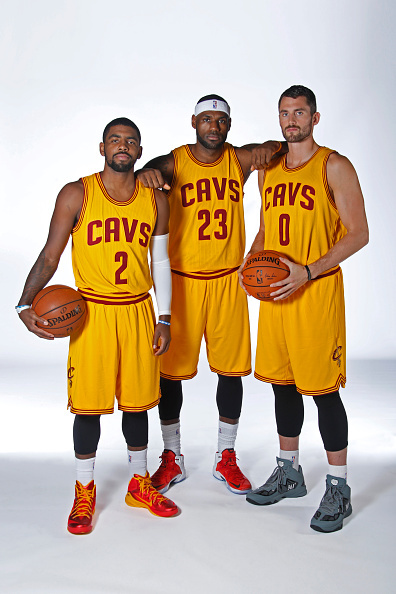 Now, they have two stars to build around for the foreseeable future. Biggest loser: Rockets. So far, Houston lost out on the LeBron James Sweepstakes when he opted out of the final year of his contract with the Cleveland Cavaliers, watched as Trevor Ariza—a leader in the locker room and key 3-and-D player on the court—walked to the Phoenix Suns on a one-year deal, and handed a four-year, $160 million deal to Chris Paul, who missed Games 6 and 7 of the Western Conference Finals with a hamstring injury. It’s one thing to stand pat when you feel like you should’ve been in the Finals. It’s another to take a step back by virtue of age and departures, which the Rockets just did. Slate: The Lakers have come out on top so far. With the completion of signing LeBron James, they not only received the most talented player in the NBA (right now), they received a teammate that will draw other free agents. As a result, the Lakers have already signed JaVale McGee, Lance Stephenson and Rajon Rondo. All three players bring veteran skills and experience that much of the 2017-18 Lakers’ roster lacked. Additionally, while the Lakers might not bring home the Larry O’Brien Trophy this season, they have now proven that the braintrust of Jeanie Buss, Magic Johnson and Rob Pelinka really know how to get who they want. A strength that could come in handy down the line. As far as the biggest loser goes, I believe that Philadelphia has seen a series of unfortunate events. While they were able to re-sign J.J. Redick to the roster, they missed out on LeBron. They had set up a meeting with James in Los Angeles, and he sent only his agent to attend. Additionally, it was reported that the team had warned Philadelphia police that they anticipated potentially disruptive public celebrations on Tuesday, when they believed they’d be signing LeBron. While they still have time to find someone else, they won’t find anyone that will compare to LeBron. 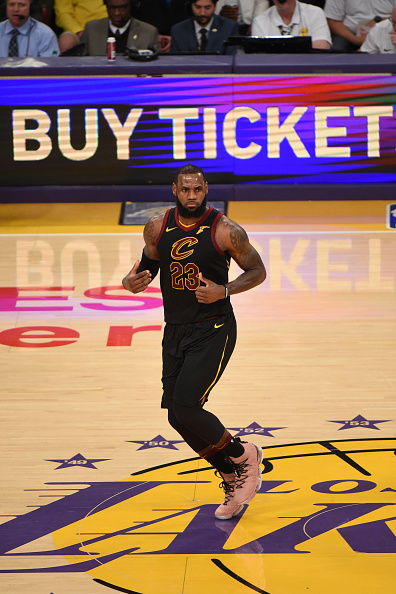 Yousuf: The team that got LeBron James was bound to be the biggest winner, so the Lakers take that crown. I think along those lines, the Celtics and 76ers are also winners, not necessarily for what they did but more because LeBron is out of the East, meaning one of those two teams are my early pick for a spot in the NBA Finals. Lastly, I think the Mavericks have to feel very good about the situation they’re in with acquiring DeAndre Jordan. To do that on a one year deal means so many different things. If things don’t go according to plan, he’s a trade piece at the deadline for a contending team that needs a rental at center. If things do work out, Dennis Smith Jr. and Luka Doncic have a great pick-and-roll guy on offense and the Mavs have some rim protection on defense. As for losers, I’ll go bold and say the Rockets are my losers. Signing Chris Paul is fine, but this is a guy who has had trouble staying healthy and he didn’t get any younger so a long term deal could be pretty painful in a couple years, if not immediately. Then, they also lost Trevor Ariza, so it doesn’t help matters. Wallis: A big winner is the Lakers. The biggest winner is LeBron. When it’s all said and done, LeBron will go down as one of the many all-time greats who wore purple and gold. The Lakers will continue to sign big-time free agents through the years because, well, they’re the Lakers. But there’s something that will be even more defining than the games LeBron will play in Los Angeles or the championships he will potentially win: The power he continues to wield. LeBron decided to go to a team that won 35 games last year with a group of young, unproven players and a Rondo-Lance-McGee trio that will be trying desperately not to be in the next LeBron frustration GIF. The point is this isn’t about what will be happening on the basketball court—this is about LeBron getting what LeBron wanted and he made it happen on his terms. 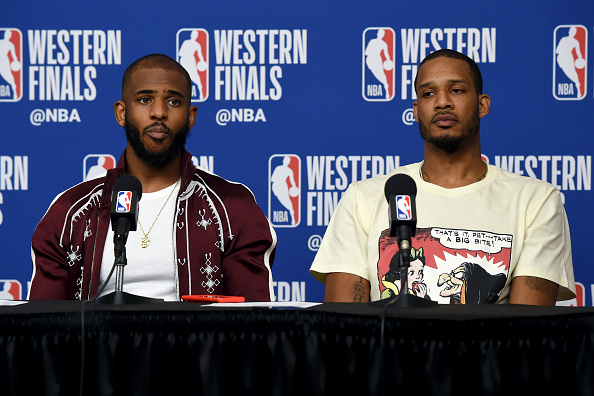 With the Houston Rockets retaining Chris Paul and Gerald Green but losing Trevor Ariza to the Phoenix Suns, do they slip out of their position as the second-best team in the West? Wallis: As of now, no. They still have two of the best one-on-one creators in Harden/Paul and can jack up 50 three-pointers on any given night. Whether or not they are the No. 2 seed when the playoffs start next spring, they will still have the second-best odds to come out of the West behind the Warriors. Ariza was this team’s Swiss Army knife and almost always guarded the opponent’s best scorer on the other team night in and night out. But there is an established system in place that this core trusts, and Ariza’s replacement 3-and-D wing (James Ennis, maybe?) will have a defined role. P.J. Tucker can also increase his defensive workload. D’Antoni likes to keep his rotations tight, and after 82 regular season games, the Rockets will have figured out how to replace one of Paul’s favorite teammates. The only way my answer changes is if Houston loses Clint Capela. However, I expect Houston to match any offer for their big man. Wimbish: Not at all. 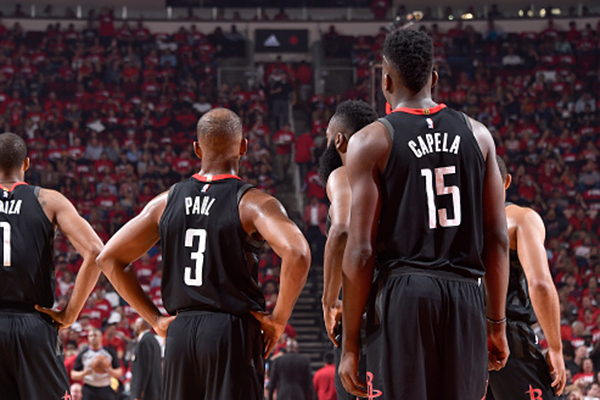 Yes, losing Trevor Ariza is a tough loss for the Rockets, but arguably the most valuable piece to this Rockets team is Chris Paul, so being able to secure his contract is a huge win for Houston. Remember, the Rockets were a game away from The Finals, with a healthy Chris Paul they very well could have been the ones hoisting the championship trophy. Looking around at what other teams have done thus far in free agency there isn’t a team in the West that can dethrone the Rockets for that No. 2 spot. If the Lakers add another piece or two next to LeBron James then it’s up for discussion, but what the Rockets accomplished last year, I don’t see another team out West that can match them other than the Warriors. 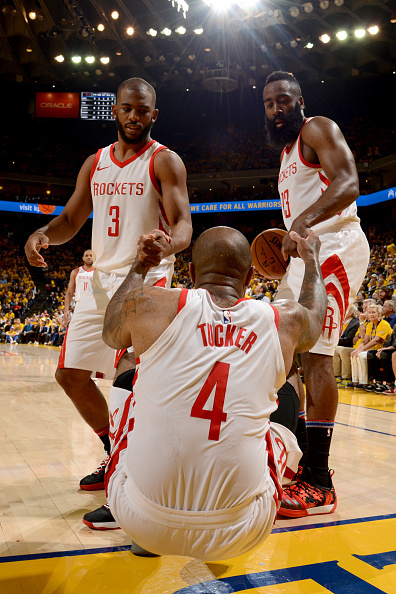 Martin: That said, Houston is probably still the West’s best bet to beat the Warriors until another challenger comes along. The Utah Jazz could have something to say about that, even if they simply keep the band together by retaining Derrick Favors. The Los Angeles Lakers might be in the mix if they land LeBron James and some veteran help. Maybe the New Orleans Pelicans stand a chance. Barring another seismic shakeup in the conference, Golden State and the Rockets look like they should separate themselves from the pack once again. Slate: With Houston losing Trevor Ariza, they have lost a significant defensive role. Securing Chris Paul and Gerald Green was definitely important though. After injuring his hamstring in the playoffs, Chris Paul has unfinished business on the Rockets. I believe he is motivated and eager to continue his chase alongside James Harden. Finding a replacement on the defense for Houston will be crucial though to stay near the top, or the Jazz, or anyone else, might sneak up and pass them. Yousuf: The Rockets are the No. 3 seed in the West, given health isn’t a factor for the Lakers and Warriors. This wouldn’t change even if Ariza had stayed in Houston but his departure certainly doesn’t help. The Lakers getting LeBron was big and some of the other pieces they got following that leave you scratching your head a little bit because of the potential for it to turn into a circus. But at this point, until it blows up in their face, LeBron gets every benefit of the doubt. The Lakers and Warriors are the two teams atop the NBA and Western Conference. Looking back on your time covering the League, what free agent signing caught you off guard the most? Slate: While I have only been a contributing writer for less than a year, this free agency period has been anything but boring. Paul George definitely caught me the most off guard because he seemed convincingly interested in being back in his home region of Los Angeles. While he still has time left in his career to wear purple and gold, he also passed up on the opportunity to play with LeBron. Unless there was absolutely no communication between the two athletes about their intended futures, I was just surprised he’d prioritize Westbrook. That being said, he still has a bright future with OKC. Yousuf: I’ll be prisoner of the moment and say take your pick of the Lance Stephenson or Rajon Rondo signing with the Lakers the last couple of days. The LeBron teams that were most effective were the ones where he had an elite offensive threat to go along with him and while Rondo can create for others, he can’t do much on his own. And then the Stephenson thing is just funny for reasons that don’t need to be stated because I’m sure everybody has seen the GIFs. I can’t wait to see how all of that, along with JaVale McGee, works out in Los Angeles. 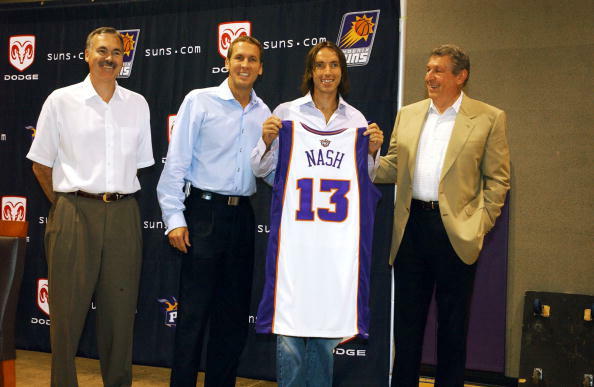 Wallis: Steve Nash to the Phoenix Suns in 2004. I was sitting at my parent’s kitchen table, waiting for my dad to bring in the Dallas Morning News so I could pull out the red-labeled sports section (as I did every morning). The only point guard I had ever watched on the team I grew up watching wanted to come back and made that clear to Mark Cuban at the time. Cubes didn’t think he was worth the money at age 30. Nash went on win back-to-back MVPs and spearheaded Mike D’Antoni’s “Seven Seconds or Less” style of play has become the foundation for the pace-and-space NBA game we are watching today. I was shocked, confused and frustrated all at the same time. This departure effectively concluded the Dirk-Nash-Finley era that I thought was going to be what the Duncan-Ginobili-Parker era ended up becoming. Martin: Probably LeBron James going back to Cleveland. That he rejoined the Cavaliers at all, after how things ended between Bron and owner Dan Gilbert the first time, was stunning. That James did so after Cleveland had been bad enough to win the lottery three times during his four-year sabbatical was flabbergasting. That the aforementioned meant he’d leave behind a run of four straight Finals appearances alongside his buddies (Dwyane Wade, Chris Bosh), for one of the NBA’s best-run franchises (the Miami Heat), in one of the most desirable places to live in the league (South Florida) caused me to question the very nature of my reality. Wimbish: I always think back to the 2016 free agency when teams were throwing money at average players like they were superstars. Nicolas Batum signed a five-year $120 million contract, and we all know how much the Memphis Grizzlies are regretting that $94 million contract they gave to Chandler Parsons. The summer of 2016 resulted in a lot of teams throwing away money because they could. That summer is the reason this year’s free agency will be quieter because so many teams spent money on players who they’re now looking to move. For the teams that were smarter with their funds in 2016 it will pay dividends next summer when a lot of big-name free agents hit the market. Let’s play a game: If you could go back to any free agent signing in history and change the decision, who would you choose and how would you change it? 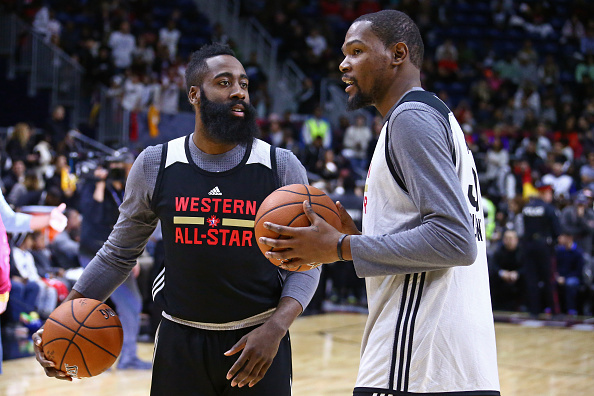 Yousuf: If I could change one signing, it’s definitely Kevin Durant to the Warriors. Look, I’m not that grumpy old guy that says superteams are bad for the NBA or whatever, but joining a 73-win team is just no fun for a guy who will go down as one of the best players in NBA history. I’m not saying he had to stay in Oklahoma City and play with Westbrook, which I’m sure is no easy task, but let’s send Durant to Houston and pair him with his old teammate James Harden and see how that plays out. Houston would have been an immediate threat to Golden State and does Chris Paul still end up there or does he go elsewhere? That would have been intriguing. Wimbish: It would definitely be Kevin Durant going to Golden State, but not for the reasons you may think. I don’t think the Warriors ruined the NBA and I don’t think Kevin Durant took the easy way out, it just would have been so much more interesting to see him sign at least a two-year deal with a player option with OKC to see if they could get Golden State the following year. They were up 3-1 in the Western Conference Finals! Durant should have tried to run it back one more time to see if there was anything left with that team. I think if Durant stayed one more year to see if they could get over that hump, the reaction to him leaving would have been milder. Wallis: See answer to previous question. While Nash was in Dallas, the Dirk-Nash duo relied on a pick-and-roll game that was deadly but didn’t require Dirk to do much work in the post. Smaller guys could switch onto Dirk, and he wasn’t comfortable enough (yet) to handle these matchups. But it was during this time—with Nash zigzagging around picks—Dirk learned to bully traditional bigs with his ability to knock down the three-pointer, pull up in the midrange and even roll to the rim. 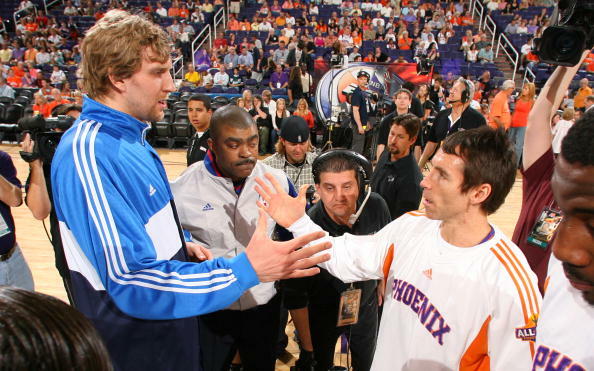 Nash never got the chance to play with the evolved version of Dirk. Well after Nash left, Dirk was forced to make changes to his game after being tortured by all the smaller Warriors defenders in the 2007 playoffs. In the coming seasons, he progressively started using his footwork and awkward angles to work through and around the peskier defenders. There was no longer a clear-cut solution to stop a Dirk fadeaway (see Dirk’s 2011 playoff run). Even though the Mavs eventually landed Jason Kidd right before their championship run to give the Mavericks offense a floor general to make it all come together, Nash was (and still is) one of Dirk’s best friends off the court and showed a deep understanding of Dirk’s strengths. That last part would have only grown with time. While these two did play six years together early in their careers, I wish we could have seen Nash’s uptempo offense combine with Dirk’s advanced offensive skillset to make what could have given Stockton-Malone/Parker-Duncan a run for their money in terms of iconic pick-and-roll, guard-forward duos. Martin: It still bums me out that the Dallas Mavericks let Tyson Chandler walk in 2011—fearing the financial implications of his potential return—rather than actually trying to defend theirs and Dirk Nowitzki’s first title. Dirk deserved at least that much, as a franchise legend and all-time great. Instead, Chandler spent his best remaining years on a New York Knicks squad that never advanced past the second round. Slate: If I could re-do a free agency deal, I would go back to 2003 when the Clippers let Lamar Odom go to the Miami Heat. While the Clippers didn’t necessarily flop by refusing to match Miami for Odom, the series of events afterwards are what made more of an impact. Odom ended up being successful in Miami with teammates Dwyane Wade and Caron Butler. It set up Pat Riley for the opportunity to achieve a trade for Shaquille O’Neal from the Lakers. I would like to have seen the Clippers keep Odom and pass up on Elton Brand, who had a more expensive contract. Worse, they could have kept both players with the right front office. Owner at the time, Donald Sterling, had the option to sign Brand for even cheaper during free agency the year before. The Clippers might have had more trading power for iconic players like Shaq had they agreed to Brand’s free agency contract in 2002, and matched Odom’s in 2003.